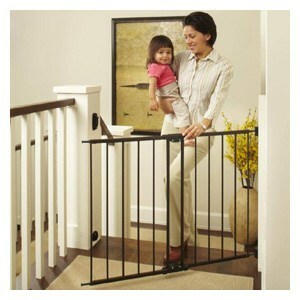 Baby safety gates are the most common helpful tools for busy parents. When children reach the age of 6 months or more, they tend to move around quite a lot on their own. With just a blink of an eye, they could be crawling away out of sight into dangerous places in the house. 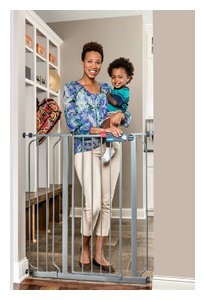 With the help of safety gates, you can set limits to space while ensuring your lovely baby’s protection. With studies and analysis over selected safety gates, we come up with the best 10 for your reference. 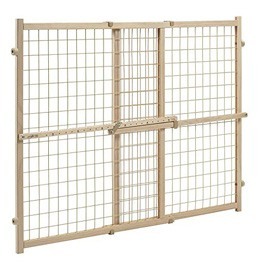 Of all the selected safety gates, this one stands on the top 10th, and it is very superior to its shape and size. It stands at 41-inch tall, which is among the tallest while fitting itself between a 29 and 37.5 inches wide. That is an excellent measure, and it suits the protection of your children between 6 to 36 months. Another distinctive feature is that you do not need to unmount the gate when you need to pass to the other side. With a simple one-hand-open lock, you can easily walk through it. You are going to fall in love with this product from Evenflo. 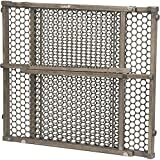 Instead of entirely made from metal or wood, this safety gate is mostly covered by soft see-through fabrics that is the safeties protection against head bumps. It is also super-wide fitting any frame between 38 and 60 inches. The installation is effortless and so is the removal. The thin cloth could be removed and put into a washing machine. If you have a smaller doorway, you may want to try this out. It mounts perfectly for any opening between 28 and 42 inches. I have to admit this one is very durable and it fits snugly to the frame. The height is at 24-inch tall, which I would recommend for your curious toddlers and kids below 3 years old. It is also an excellent divider to keep your pets in a particular designated area. This product is designed for safety, durability, and ease of use. If you need an extra-secure closure for stairs with an opening between 28 and 48 inches, this is a perfect choice. The unique part is that it serves as the closure, as well as a swing gate which could be open with one hand, and it swings at only one direction to ensure it does not open over the stairway. 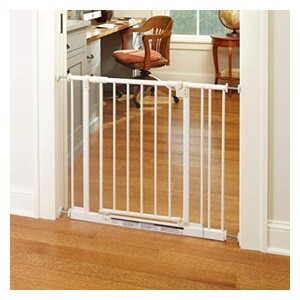 Here is another ideal gate for both the protection of your kids and keeping your pet. The width is very adjustable, and it would fit any standard doorframe, hallway, or stairs with 31 to 50-inch expansion. The entire frame is made of sturdy woods, and it is not only straightforward to set up using a classic pressure-mount lever, but it also assures no damage caused to your walls with the non-marry bumpers. The secured vinyl-coated mesh leaves you complete trust that your child is protected from any household harms. Here is another product from the North States. As the other safety gates from this manufacturer, this Supergate comes in high quality, durability, and very friendly to the users. It connects firmly to any opening or gate between 28 and 31 inches. It also comes with an extension that you can expand the width up to 38 inches. The swing door grants you the extra agility to move around while the door could be securely closed for the protection of your children. Regalo is well-known for its tall signature products. Again, this gate stands at 41-inch tall and extend itself across 29 to 34-inch openings. 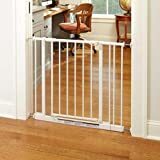 If you have a wider gate, there is an extra extension that allows you to push the limit to 40 inches. 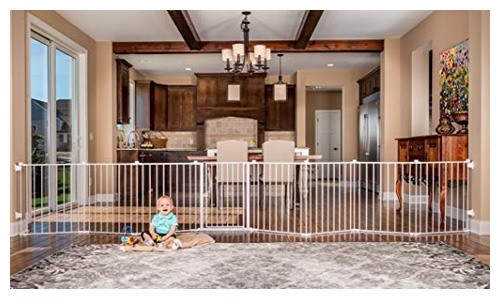 The sturdy steel assures to keep your child in a protected space while you can have the option to walk through with a swing door that can be open with a single touch. Enjoy the widest and the most creative safety gates from Regalo. 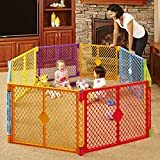 There are many varieties of how you can use this in your house as it does more than just for the protection of your babies. Try using it to wrap around your fireplace, or make it an enclosed play area for your child. Using eight inter-connected panels the gate stretches across a maximum extension of 192 inches. This is big enough for you to mount from one wall to another wall of your house. The portability design makes it very friendly to use it either indoors or outdoors. Here is the most popular product from Regalo but the second stander of the best safety gates this year. 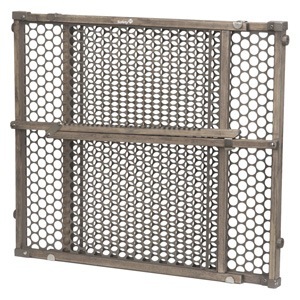 It is the standard size gate at 29-inch tall with the stretching power between 29 and 34 inches. Coming along in the box, there is an extra extension piece to widen the width up to 40 inches. Like most other Regalo safety gates, it comes with a swing door to allow you to walk through. Now, this is the most outstanding deal of the year, and it goes to the Superyard from the North States. The variety of colors on each frame makes the product eye-popping while very attracting to children. 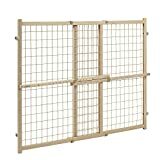 Designed for both indoor and outdoor usage, you can just enclose these panels together and create a child-friendly space or stretch it across an extensive area to make a protective wall. 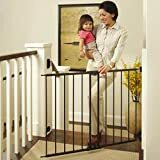 We have come to the end of the review of the top ten best safety gates in 2017. The shape and size are the core things to look at when you need to purchase one. You do not want to end up bringing a too big or too small gate for your frame. You also need to consider the place at which you mount the tool. For example, at the top of the stairs, you would want to avoid using the pressure mount since it may fall off upon high impacts, and that could be dangerous for your kids.